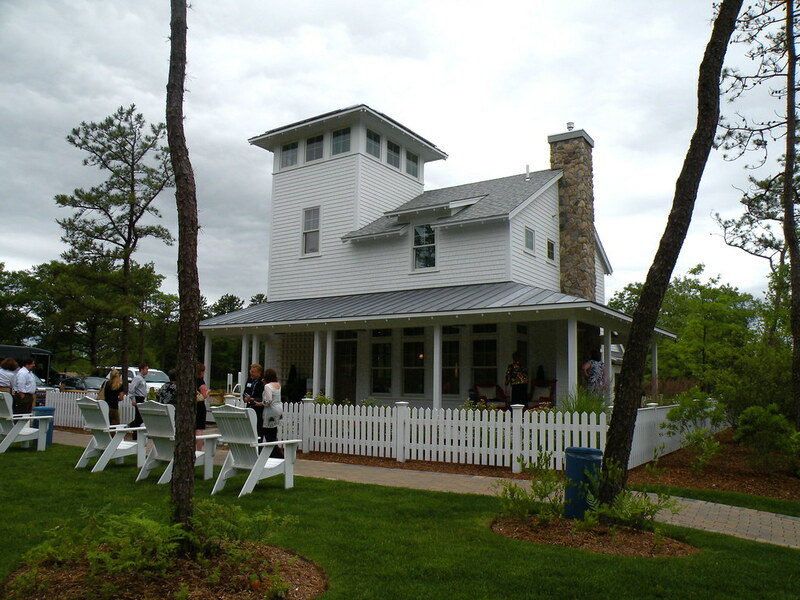 The white shingle house is approximately 2,100 square feet which fits with the green concept. The wrap-around porch with the deep overhang offers protection from the sun’s heat, which keeps the inside cooler, reducing the need for air conditioning. HGTV House Planner Jack Thomasson told us that their mission is to have their homes fit into their specific environments. 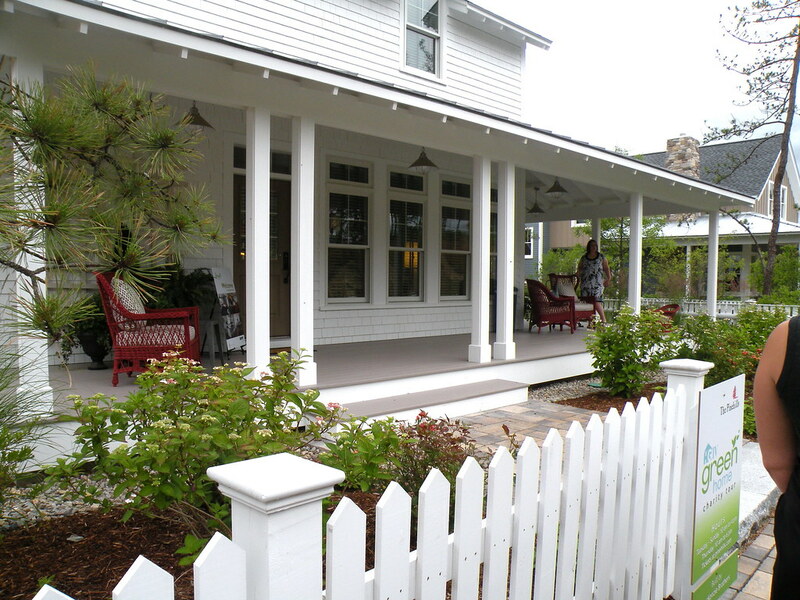 In this case, Jack said the house is “A classic Cape Cod design, with a twist”. 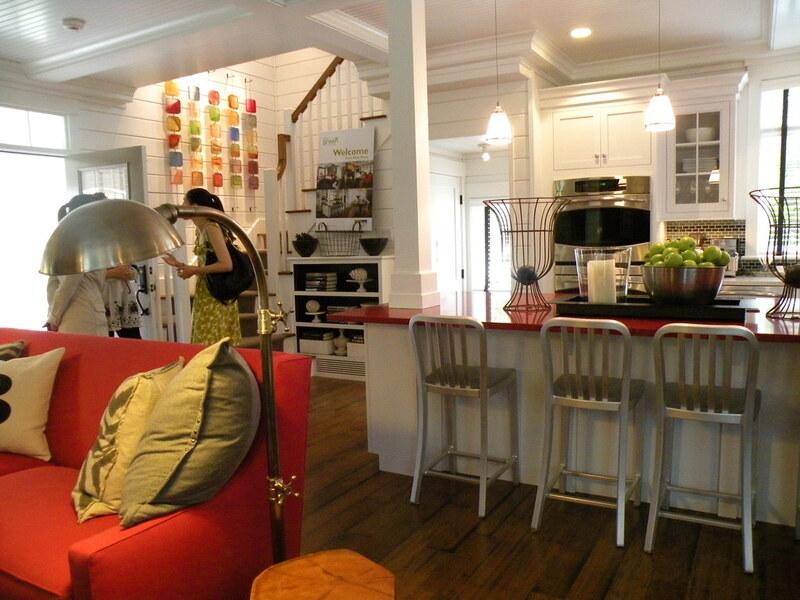 The open floor plan of the first floor features the living room, dining area and kitchen. The living room is filled with bright pattern and colors, with lots of textural pieces and original art from local artists. 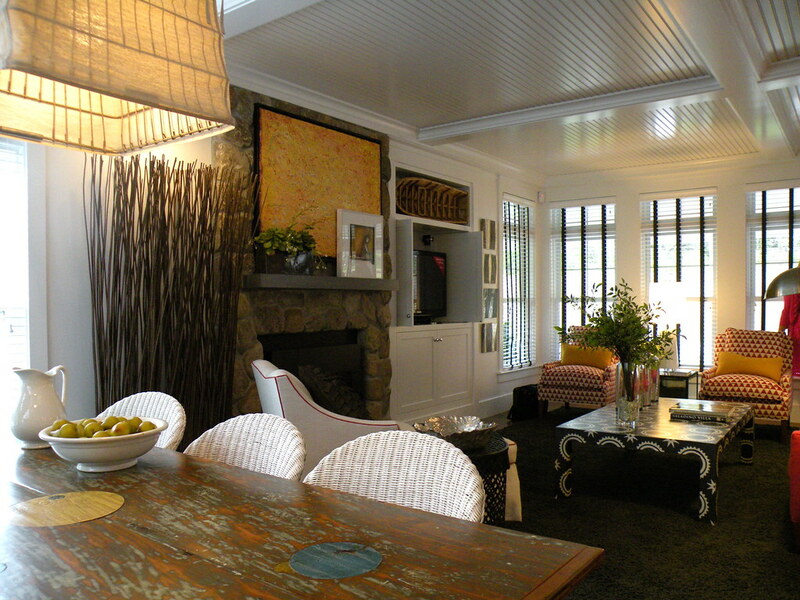 The room featured bead board coffered ceilings and a stone fireplace. 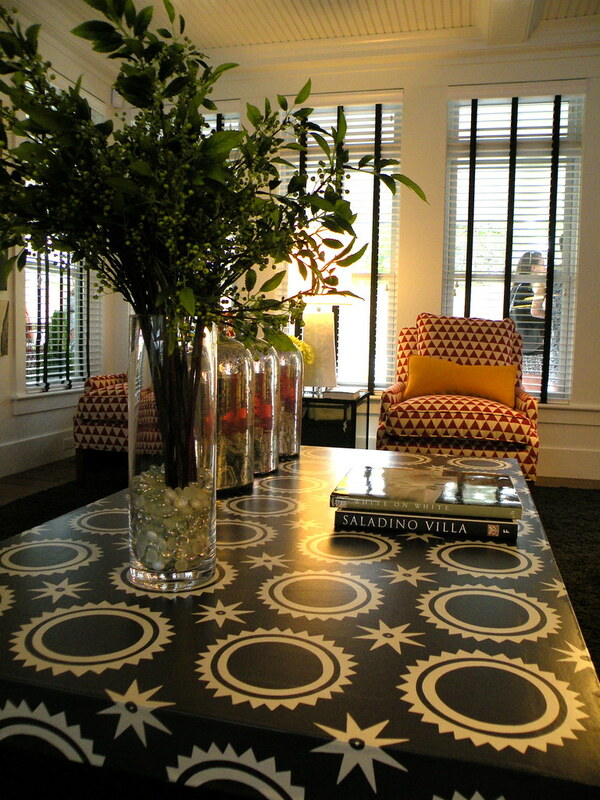 The geographic coffee table is by Audry Sterk Home Collection, available at Nantucket Looms. 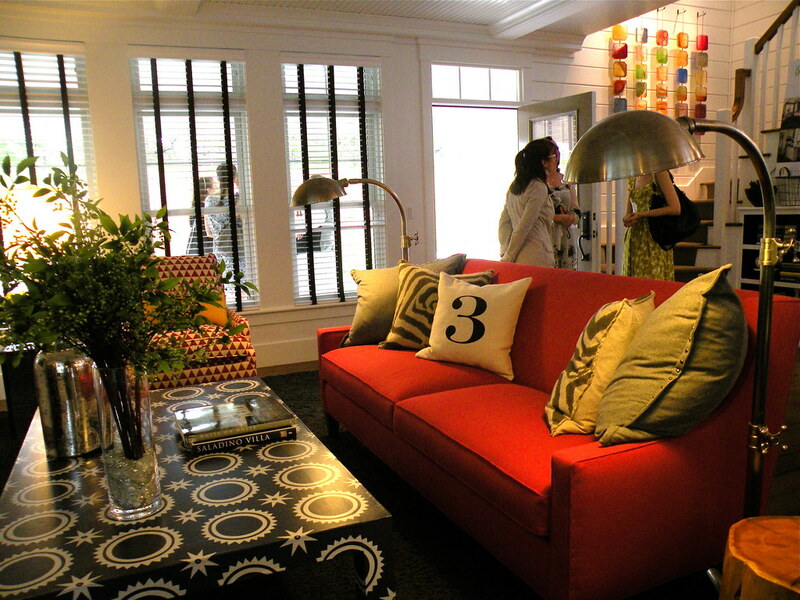 I like the sprightly red sofa (a theme color of the home), although not so much the pillows. The dining area is situated next to the living room area. This vintage wire basket fixture was purchased at Found in Houston. I believe that the designers prefer to select pieces that come from stores local to the home, however, designer Linda Woodrum told me that this piece was so perfect that she felt she needed to use it regardless. Totally the right choice – how fabulous is this?? I have been dreaming of how I can make one and where I would put it! The dining room table is by West Barnstable Tables. Simple wicker chairs and creamy white stoneware pieces finish off the space. 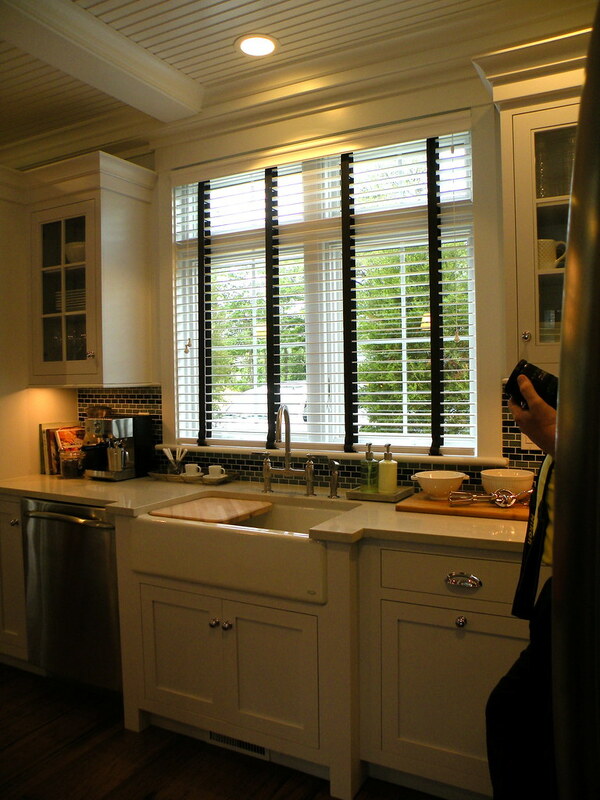 The kitchen runs along the backside of the room – and I must admit – I don’t love it. 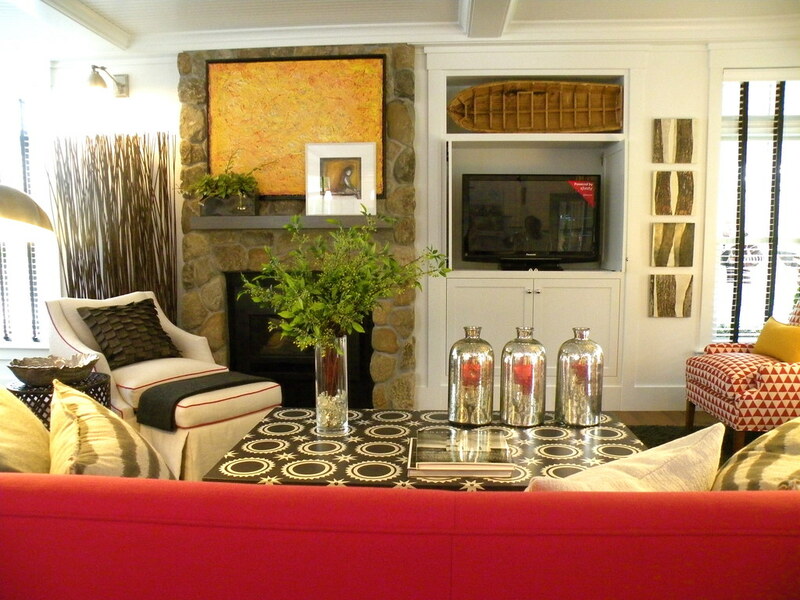 For a relatively small space, there is too much going on. I would have preferred something a little simpler and less over-styled. However, the individual elements are gorgeous. The blue mini-subway tile back splash is Shaw’s Glass Essential Block. The farmhouse sink is surrounded by Shaker style cabinetry painted in Sherwin William’s Extra White. 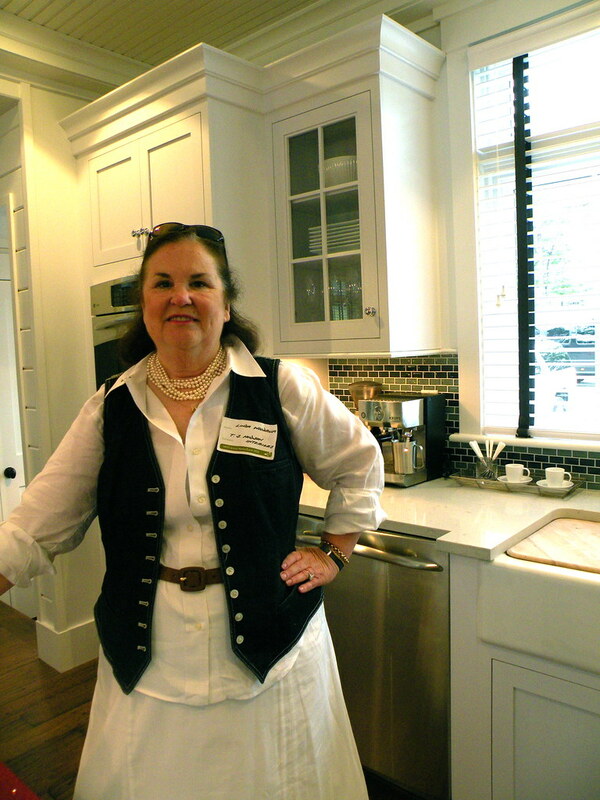 Interior designer Linda Woodrum of Hilton Head, has designed nearly all of the HGTV Green and Dream homes for the last fifteen years. A pretty good gig! She was very open and generous with information, answering whatever questions the crowd of decorators had to ask. She acknowledged that it was a bit nerve wracking to have other designers viewing her space while she’s there. Because, of course, we all have our own opinions! 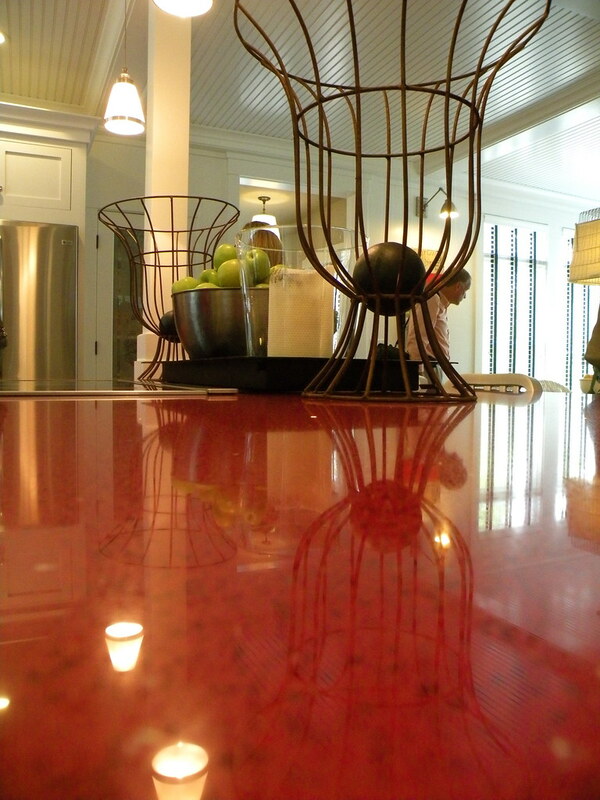 Clearly, the ruby red Caesarstone natural quartz center island counter top is the showstopper of the place. Just gorgeous! The fabulous rusty vintage wire urns are from Dovetales in Plymouth. My favorite space in the house is this fabulous laundry/mud room tucked down a hall from the main room. Nearly everyone who walked in oohed and aahed over the red washer and dryer, set off against the medium dark blue gray (Sherwin William’s Cityscape) bead board woodwork. 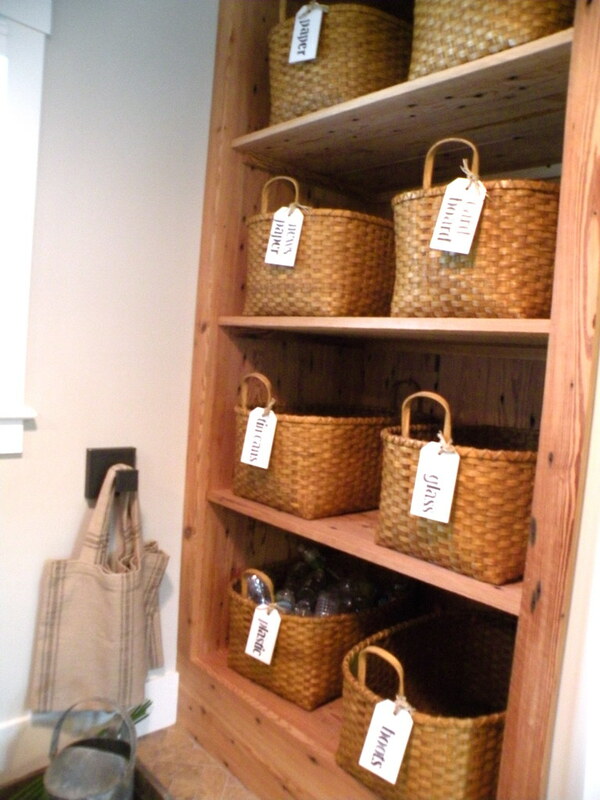 Storage shelves filled with New Hampshire Hancock baskets are on the opposing wall. 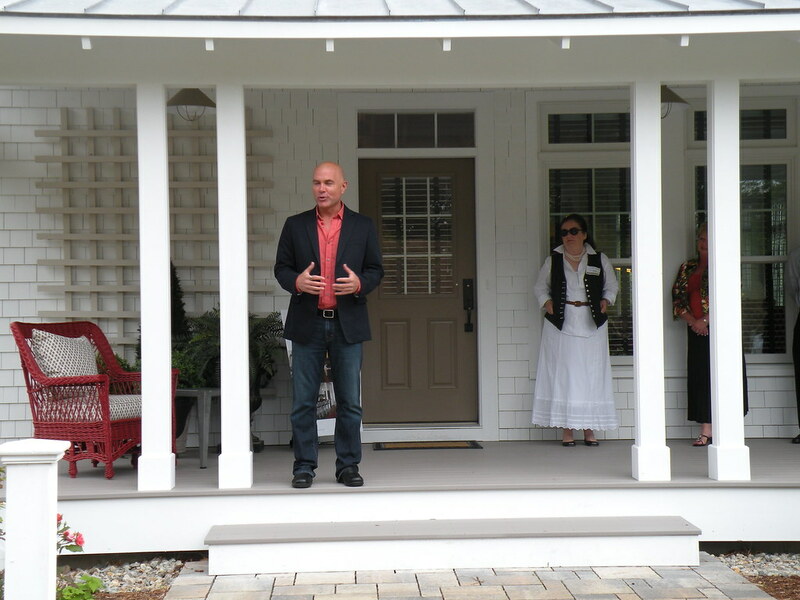 I hope you enjoyed my photo tour of the 2010 HGTV Green Home’s first floor. One lucky person will be winning this home – and everything in it. As a matter of fact, we were specifically asked not to sit on anything because they like to hand it over completely “new”. Click here to read my post on the second floor and what I would have done differently. Tick Tock – I love a clock! I'm sure it's even more lovely in person. But… being from that exact area, I already knew what I would need to change in order for someone to actually buy it if necessary. You know us stodgy New Englander's. Can't wait to read about the second floor. That loft/office looks pretty good to me! They did a beautiful job on the home (of course now I'm curious and want to hear what Kimberly would change). My nephew & his girlfriend put their name in on this "sweepstakes" every day, ha, ha.. I think they even set their alarm to be sure they didn't forget every day! Many people could be very happy in that home. When are they drawing the winner Linda? I agree with you on the laundry/mud room. Beautiful! I would like to do something similar when we replace our washer & dryer with front loading units without stands. My husband is hesitant to install a countertop over the washer & dryer. He thinks that it will be too difficult to get to the back of the units, if necessary. Do you have any thoughts on this? It's so different than last year's house! You know what, I feel like I am seeing more and more of those blinds with the dark (i don't know what to call them) suspensions. I like the contrast. It's sharp and fresh! Thanks for sharing, I had forgotten about this. That red ceasar stone counter is stunning thanks for showing us! I LOVE everything Linda designs her taste seems to be in step with mine. One talented lady if you ask me !! Great post Linda. It is styled within and inch of it's life. And while I applaud the red kitchen counter — been waiting to see one of those in rosso alicante — the red-white-blue scheme in the kitchen notsomuch. 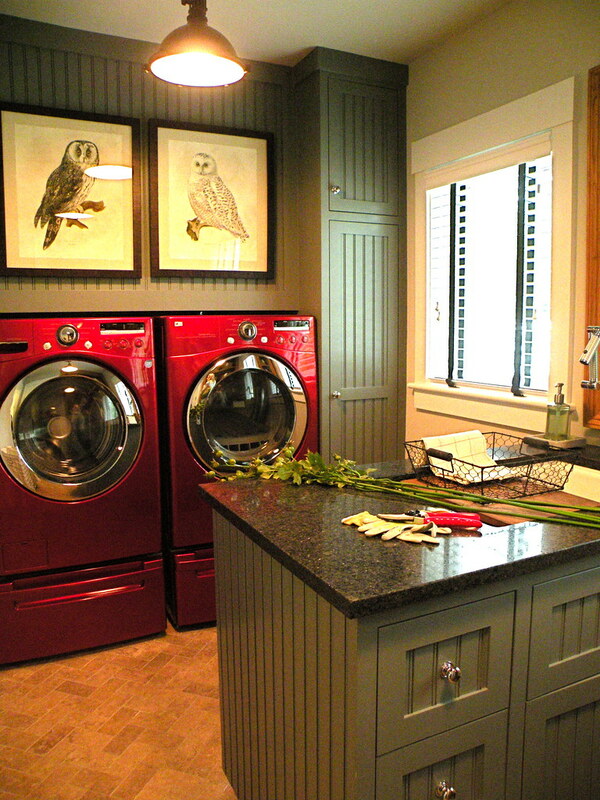 For me, laundry room has the more seductive scheme. So, how does someone get in on the house lottery? Speaking of winning, we have a kitchen backsplash giveaway closing tomorrow with a new Friday giveaway link up. Best, Jane F.
Thanks for visiting us. I love the opportunity to discover your blog.